Brandberg National Monument Area is part of the Tentative list of Namibia in order to qualify for inclusion in the World Heritage List. It seems that we are the first reviewers of this TWHS which is not really a surprise given the fact that the Brandberg is not included in most travel agencies' routes. The Brandberg ("Fire Mountain") is not really a mountain but a whole massif inclusing Namibia's highest peak. 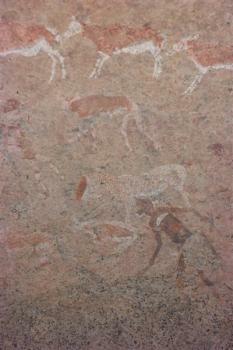 Most people visiting the area do so because of the 'White Lady' rock paintings (as we did). These paintings can only be visited with a guide and requires a 2 x 45-60 min walk, but this gives the opportunity to enjoy the Brandberg massif and the guide also gives some explanation about fauna and flora. The state of the rock paintings (especially the colors) is amazing given the fact that they are approx. 2.000 year old and relatively unprotected. Additionally, they form a nice combination with the Twyfelfontein WHS (be it that these are rock carvings instead of paintings).